up the bald spots in Trump's rhetorical slam at Barack Obama's energy policies. 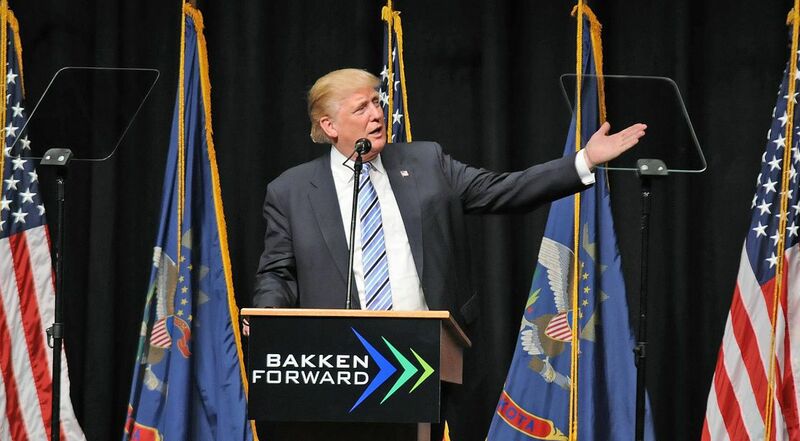 The collective frustrations among North Dakotans, who've watched their drilling-rig count drop from 208 in 2012 to 30 last month, gushed into a love fest ("the energy just rolled in," said one observer) for Trump and his savage slams against the administration's energy policies. "If President Obama wanted to weaken America, he couldn't have done a better job," Trump declared. Those energy industry-dependent North Dakotans may have loved it, but the line is total baloney. Consider that 8 years ago, June, 2008, a few months before Obama was elected to his first term, retail gas prices were well over $4 a gallon. They subsequently collapsed, along with the rest of George Bush's lame-duck economy, but the fact is, 8 years later I filled up in Rapid City yesterday at a bit over half that much. Gas prices now are about what they were in the mid-1970s, and that's without correcting for inflation. As an old commodities trader and broker I know that presidential policies don't determine the price of oil in this world, but it seems pretty clear that cheap gasoline today is not indicative of a weakened America. Certainly those of us directly involved in the tourism industry here in western South Dakota have seen a nice uptick in business the last couple of years, with relatively cheap gasoline prices probably having something to do with it. There's nothing weak about that. I'd call a locally robust energy-dependent tourist industry the exact opposite. Why Does Trump Call This Weak? million barrel a day increase during his term, to nearly 14 million barrels a day, making the U.S. the world's largest oil producer. I don't know where Trump gets his "weaken America" stuff, but outpacing the rest of the world when it comes to oil production doesn't seem like a sign of weakness to me. As to responsibility or blame for oil production, it has more to do with global political and economic forces, along with new extraction technology, that are basically unrelated to Presidential policy-making. Trump's pandering tirade in North Dakota has neither logic nor history behind it. During Obama's tenure, domestic oil production is at a 50 year high and oil imports are at a 30 year low, less than what they were in 1995. There are things I don't like about Obama's energy policy--I still think the Keystone pipeline should have been left to local market forces and regulators for a decision--but claiming that his policies have left America in a weakened position on energy production and marketing doesn't stand the test of the bottom line. Trump's rhetoric combs over the reality. As he might say: not good! What's That About Bill Clinton's Fantastic Economic Performance? Tell It To South Dakota's Ag Industry, Hillary. Hillary Touts Him Now For The Economy? November. She said Bill will be "in charge of revitalizing the economy because, you know, he knows how to do it." Though, honestly, I'm likely to vote for Hillary in a two-way match-up against Trump (I've already noted here why I think his trade-war rhetoric would be a disaster for South Dakota's ag economy), I wish she'd lighten up on the over-hype about Bill Clinton and his economic performance. He didn't set off the information technology boom nor create the sharp drop in oil prices that kept the '90s economy perking. And as far as the grain and livestock markets--the lifeblood of South Dakota's rural economy--are concerned, Clinton's administration was a disaster. Prices stagnated during the 90s, falling in real terms as SD producers had to pay continually higher prices for their operating supplies. and signed it just the same, going along with the GOP congress and leaving a lot of American farmers in pretty tough shape during the next few years, when prices did indeed collapse. Further kow-towing to the financial libertarians in Congress, Clinton closed out his last term by signing a couple of the most disastrous financial deregulation bills in history. The most well-known is the Financial Services Modernization Act, which disintegrated the firewall between brokers and bankers, making easy money lending to unqualified borrowers a way of life that blew up in 2008. The second is more commodity-connected and less well known, but just as insidious in effect. It was the Commodity Futures Modernization Act of 1999, which allowed the derivatives market to trade independently of oversight and regulation of the Commodity Futures Trading Commission. 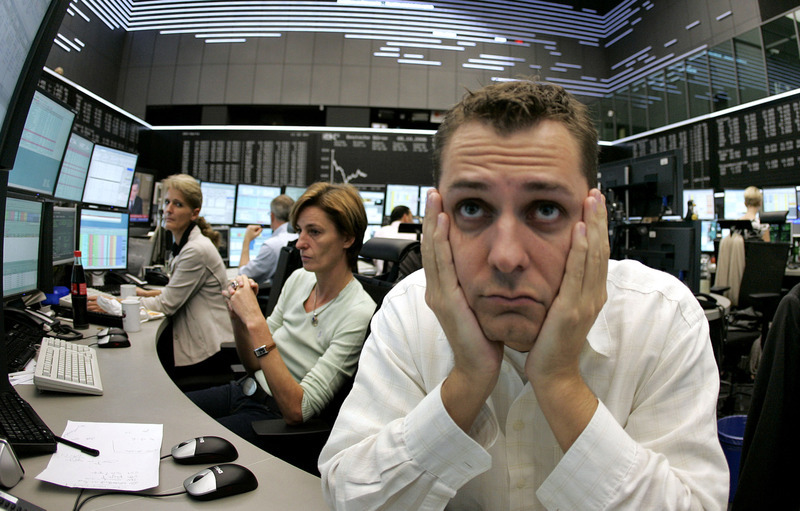 I was a broker registered with the CFTC at the time, used to lots of regulation. Although it seemed odd and a bit uncharacteristic for the regulatory reins to loosen, loosen they did, and Clinton's handiwork turned into a near-apocalypse eight years later. I don't think Bill Clinton understood the implications of what he was doing, either on farm policy or financial deregulation. Using him and his track record as a prop for her economic platform is predictably political, but Hillary should know that doing so runs the risk of sudden exposure. What? SD Senator Thune Wants The Government To Regulate News Content On The Internet? Seriously? Can't See 'Em . . .
How wierd is this? Our Senator John Thune is calling in the federal cavalry because yesterday the news broke that some former Facebook staffers claimed that they were ordered to manipulate the Facebook news feed. They told the website Gizmodo that the goal was to "suppress conservative news." Though a Facebook user myself, I rarely glance at the newsfeed scroll, so I haven't got a clue about its ideological bias, if any. Just the same, even if the bias exists, I don't get where the federal government has a place in monitoring or even questioning it. I mean, this is still America, right? Thune takes a different view. His sternly worded letter to Facebook CEO Mark Zuckerberg politely asks Zuckerberg to "please provide responses" to a list of questions about the structural and editorial aspects of the "Trending Topics" section, then peremptorily sets a May 24 deadline for a response, which apparently is meant to take place before Thune's Senate Commerce Committee. Thune says in his letter that the committee has "oversight authority" in the matter. The Constant Commoner . . .
your demand that Facebook--certainly a part of the many "diverse forms of media" in place today--answer to you and your committee for the way it wants to present the news? As it turns out, even though Thune's '07 effort apparently went nowhere, the "fairness doctrine" itself was eventually expunged by the Federal Communications Commission in 2011. There seems to be no codified justification for Thune's notion that his committee has oversight authority when it comes to news content on the internet. When Thune lost his battle on net neutrality last year, the upshot was that the FCC would gain regulatory control of the internet. However, as the "fairness doctrine" is no longer in place, I still don't get where the source of power for content oversight is. I don't think it exists. If I'm wrong, I invite his office to correct me here. Meantime, Thune's quick assertion of federal authority is amazingly at odds with his general stance against government overreach. If you Google "John Thune government overreach," you will get countless pages of articles in which the senator utters the phrase "government overreach" to criticize legislative actions on fronts as diverse as energy policy, waterways management, Supreme Court nominees and healthcare--and that's just on the first Google page. Now all of a sudden Thune wants to extend the government's reach to a website and how it develops and disseminates its news content? It makes no sense. 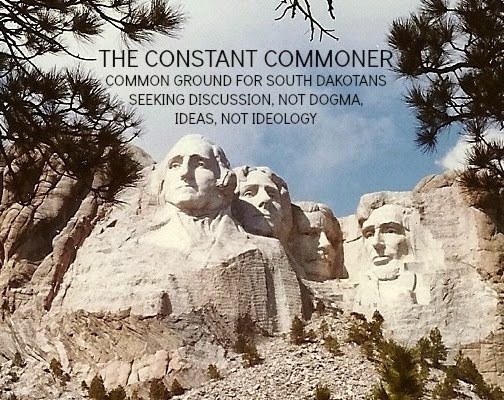 Thune should drop this silly idea posthaste. SD Congressional Delegation, Fall In! Repeat After Me! "One, Two, Three, Four--Who Will We Be Voting For? Five, Six, Seven, Eight--Trump Is Our Candidate!" Why Does SD's GOP Leadership Like Him? obedience without question. That system worked with some excellent effect when I was in a skirmish in Vietnam, but it does make me a little uneasy when I see it on display by our elected officials. 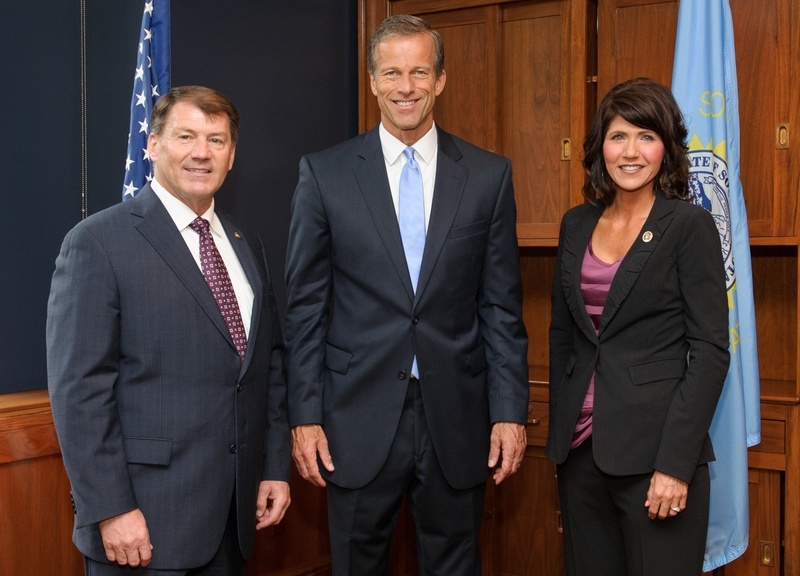 Last week's reflexive support of Donald Trump by our 3 Republicans in Congress makes it plain as day that Noem, Rounds and Thune are more committed to political partisanship than to the principles of conservative government that propelled their campaigns. I guess it's too much to ask of these partisan ciphers to take a principled and reflective stand, a la GOP House Majority Leader Paul Ryan, before clambering aboard the Trump bandwagon with the rest of the presumptive Republican nominee's unquestioning devotees. It would have been far less unseemly if an eventual endorsement had followed a period of examination and evaluation of Trump's philosophies and agendas. Certainly an explanation to us South Dakota Republicans about their respective reasons for endorsing Trump would have at least clarified the discrepancy between their political and ideological imperatives. I would certainly like to know how they can get behind the nominee who wants to wipe out the positive effects that American trade agreements have had on South Dakota's leading industry, agriculture, for the past several decades. South Dakota's exports grew 139 percent between 2003 and 2013, thanks largely to free trade agreements (FTAs), per the Business Roundtable, which also notes that the rate of export growth is about twice the rate of the state's GDP growth. Did our unquestioningly obedient Congressional delegation consider the impact of Trump's well-known hostility toward trade agreements on their home state's economy? I don't see any evidence. I'd like them to explain how they can so casually ignore this ultra-important element of the coming campaign by supporting a candidate who is poison to South Dakota's economic interests. Supporting Trump As Ordered, Sir! American conservatism, Breitbart, trashes him, commenting that "of course he's not a conservative. He was for Nancy Pelosi before he was against Nancy Pelosi." Similar sentiments ("Trump doesn't represent the Conservative base") have been expressed by National Review Online, the conservative journal founded by the legendary William Buckley. It seems pretty clear to me that many of his followers, including our Congressional delegation, are more smitten by Trump's populist bombast than any coherent stream of positions that actually do reflect conservative thought. Just today, Trump on Meet The Press said his tax plan is actually a proposal, subject to political modification. Considering how consistent that utterance is with his chameleon-like history, I challenge our conservative Congressional delegation to explain to us why they embrace him with such ardor. Please Stay In SD . Pleeease. 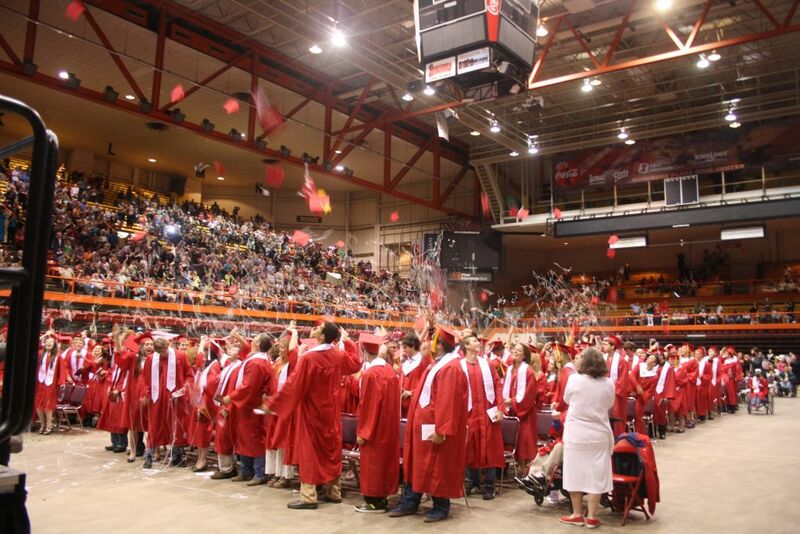 South Dakota Governor Dennis Daugaard's pro forma message congratulating this year's high school class, published a few days ago in the Rapid City Journal, had an unusual fillip to it. The governor included an exhortation to the grads to remain in South Dakota, telling them that he hopes "you'll ultimately consider a future here in our state," because "there are a number of reasons to consider living and working here." Having chosen to relocate here to the Black Hills after a lifetime in L.A. and Chicago, I get the governor's bits about the charms of life in South Dakota, where I happily raised my family. Disheartened as I was to see my offspring and so many of their peers immediately split this verdant scene upon graduating from high school, I nevertheless harbor no regrets about watching them grow up here. That they're all doing not merely well, but spectacularly well (my wife's Girl Scout troop now has enough doctors--both Ph.D.s and M.D.s--to staff a mini-university), says as much about their upbringing as it does the shortage of challenges and opportunities for them in their home state. 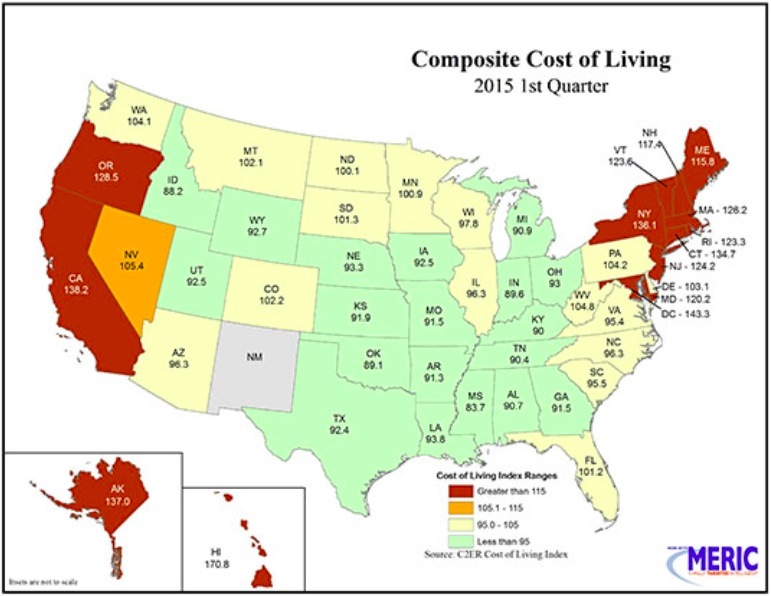 101.3 Of COL In U.S.
South Dakota has an awful reputation in this country when it comes to income opportunities relative to living costs. Even more misleading about Daugaard's stay-at-home pitch is his incomplete picture of our state's tax situation. The governor claims that because South Dakota has no income tax, workers here "can keep more of the money you earn." That is actually quite laughable when you consider the unfairness of South Dakota's tax system, so heavily weighted to sales and excise taxes. Workers here pay a much higher share of their incomes in taxes than their bosses because of the essentially regressive nature of sales taxes. The Institute of Taxation and Economic Policy ranks South Dakota among the 10 most regressive tax systems in the United States. And what do our workers get for their disproportionately higher tax rates? Stuff that I love, actually: a state where, as Daugaard puts it, recent grads can see "the stars at night," enjoy "the wide open spaces," and "have the company of friendly, down-to-earth people." Happily, I could afford to indulge these yearnings when I moved here. For recent high school graduates more focused on economic--as opposed to lifestyle--opportunities, it's probably a much different story. They can see stars elsewhere and make much better money while doing so.